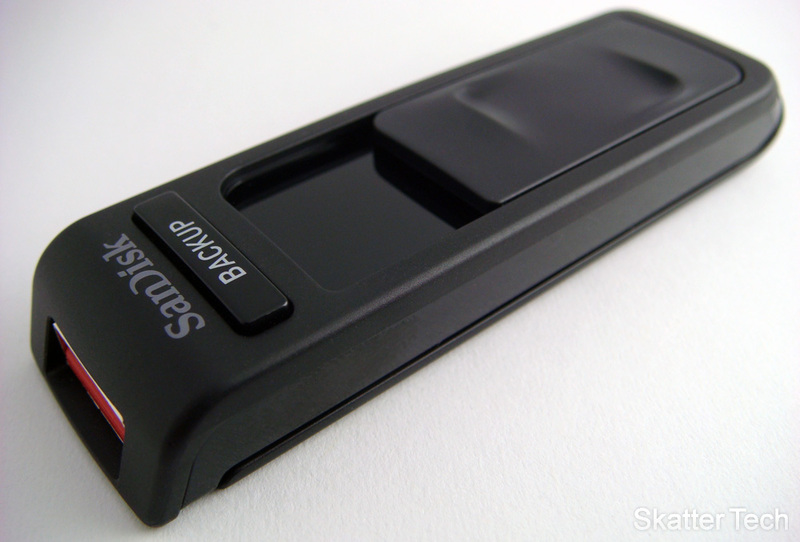 Last week, we reviewed the SanDisk Cruzer and today I bring you a review of the SanDisk Ultra Backup. As implied by the name, the flash drive has a built in backup utility and a physical button to initiate a backup instantly. If you don’t have a true backup solution, this is an excellent tool. Just like the standard SanDisk Cruzer, the Ultra Backup model retains a the same traditional form factor. The Ultra Backup is a bit larger the standard Cruzer, but makes up for the size difference with faster data transfer speeds. I copied copy a 465MB file over to the drive in about 30 seconds writing at speeds reaching 15MB/s. Copying a 700MB file off the flash drive also took 30 seconds with a read speed of about 24MB/s. The USB connector recedes into the plastic casing when not in use. A pleasant orange LED flashes when data transfer is in progress. The best part of this flash drive is the backup utility that doesn’t require installing any software. The entire application resides and runs off the flash drive itself. The first time the Backup Button is used to launch the utility, a quick setup will automatically determine what files should be included in the backup. The interface is user friendly for even the most novice computer users. If you wish to further customize what should be included in the backup, there’s a easy configuration tool to select types of files such as text, music, videos etc. The data is also organized on the flash drive retaining folder structure, which makes things easier when retrieving a file. Asides from the Backup functionality, the flash drive is still works as a normal flash drive should. Users do have the ability to disable the U3 Launcher, however that would mean that the Backup button would be rendered useless. Some password protection settings are also thrown in for additional security. Your files will most likely be safe if the average person finds your flash drive, but that’s probably not the case if it falls into the hands of someone who knows what they are doing. The Ultra Backup also features a built in Application Store which lists tons of games, media software, and other random tools. For the most part, just about all of the tools were ridiculously over priced and just seemed like an major waste of time to even try. There are fortunately a few good application such as Firefox listed. 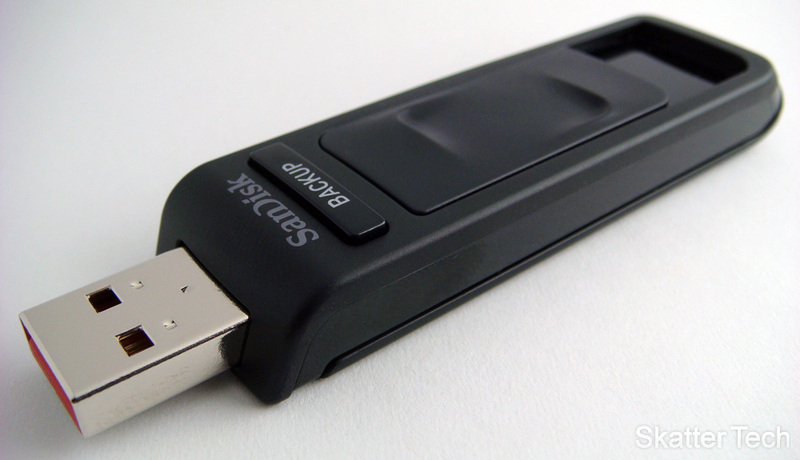 Overall the SanDisk Ultra Backup is a reliable, fast, and easy to use flash drive. The Backup utility is the highlight and is excellent for making a copy of important documents in case of data loss. I definitely found the convenience of the physical Backup button useful. SanDisk offers the flash drive in 8GB, 16GB, 32GB, and 64GB capacities for $49.99, $97.99, $166.99, and $277.99. Yes, those MSRPs are a bit ridiculous. If you pick it up from stores such as Amazon.com, it’s available for a fraction of the price.